4 X 8 Stamped Steel Floor Register - White Discounts Apply ! 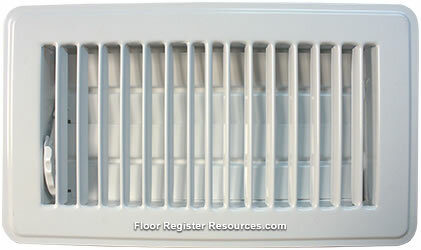 Heat register vents have a powder coat top finish for scratch resistance. This metal floor register has welded seams for added durability. Heat register vent features an adjustable steel damper to control air flow in a room. Metal floor registers are a classic design in white to suit most styles. This heat register vent is also suitable as a cool air register. These metal floor registers are quick and affordable way to update your space. ***Hint: The industry standard is to order heat register vents using the actual hole opening size and not the faceplate size. This classic white floor register will fit a 4 x 8 inch hole opening. These metal floor registers are available with a neutral tan finish and also can be bought in multiple sizes. New heat register vents are affordable and a great way to freshen up the look of your home, purchase today!